OVAL – To maintain open web space. Can be modified easily to accommodate specific hand issues. CURVED – To support transverse arch of hand. Provides primary support of arm in reducing shoulder subluxation. Provides secondary arm support in reducing shoulder subluxation. Provides arm protection by keeping elbow close to body. Provides dynamic compressive forces through wrist, elbow and shoulder. Reduces potential for accommodation of nervous system. Protects shoulder from over-tightening (impingement). Allows controlled arm swing with ambulation. Provides arm protection by keeping arm close to body. Fashioned after “figure 8” harness. Facilitates thoracic extension, scapular retraction, and scapular depression. 1″ webbing for strength and comfort. 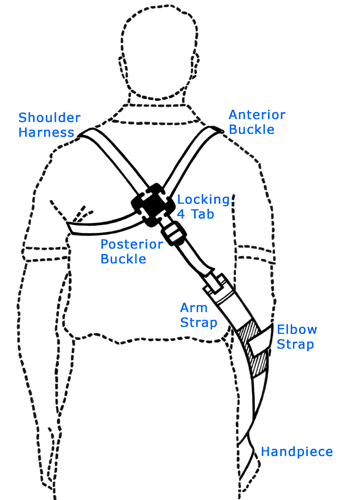 Adjust both buckles to reduce shoulder subluxation. Adjust posterior buckle independently once subluxation has been reduced to bring shoulder into neutral rotation. Maintains proper positioning of shoulder harness. Position for maximum function and comfort. Position at anterior axillary wall of uninvolved arm for maximum comfort. Position center of cross over back of wrist. 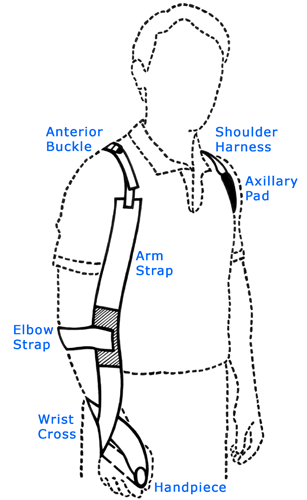 Maintains positioning of sling to properly support arm. Helps hold wrist in neutral position.